Laying down the foundation on which we'll be building all of our HTML knowledge. Welcome to HTML5! In this lesson, we'll give a brief overview of some of the new features of HTML5 which expand upon what was available in the HTML4 spec. Some features give you more modular ways to structure the semantics of your pages and others enhance the functionality available to you without the use of 3rd-party plug-ins. All major browsers have supported most HTML5 features for several years now so you can feel free to experiment with them. Using the new semantic tags will help you build more semantic pages which also have better SEO. Some of the other functionality falls more under the category of "explore it later", but is included here so you know what is potentially out there. The next few lessons will talk about the specifics of these new tags and functionalities. HTML4 was the standard for a very long time. For the historically-minded, this long article talks about the journey to HTML5 and about how remarkable and tenuous the path was. For the rest of you, suffice it to say that HTML5 layers additional functionality on top of HTML4 without actually breaking it, so old markup works just as well now as it did before. If you want to know which browsers and versions a specific tag is supported by, check out caniuse.com. 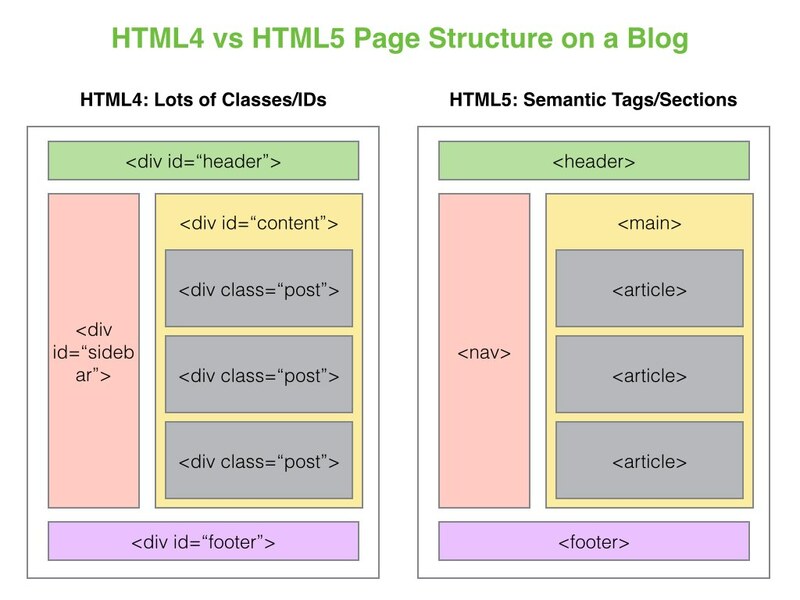 The new features of HTML5 generally fall into two buckets -- semantic tags and new functionality. The semantic tags are designed to help you organize your pages in a more logical way which plays nice with large websites, assistive devices and screen readers. A nice feature of the new spec is that browsers no longer treat the webpage explicitly as a single HTML document. They acknowledge that a page can be made up of multiple sub-pages (like the individual posts of a blog), which better reflects how dynamic web applications work these days. 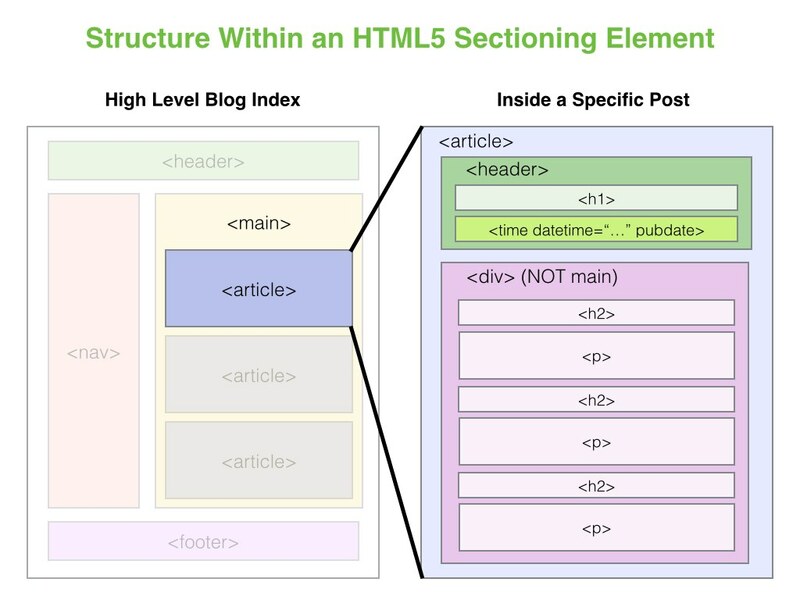 As you'll see, the "sectioning elements" (types of semantic tags) help you create this separation. HTML5 also spruces up some existing tags with additional attributes, for instance by providing new input controls like sliders and date pickers. The new "email" input field looks just like a text field but mobile browsers will alter their keyboards to accommodate it (e.g. adding the @ key). Older browsers just treat it like a text field. We've already been using HTML5 in our HTML documents, whether you realized it or not. Any time you declare the <!DOCTYPE html> atop your new document, it's set up for HTML5. In HTML4 you had to be much more specific about picking the doctype. As a brief aside, how does your browser know to use HTML in the first place when it receives a page from the server? A much stricter spec called XHTML still lingers because, for a while, forces in the standards development groups tried to push everyone into it. XHTML uses the "application/xhtml+xml" MIME type. It also blows up if any syntax errors are detected, which is a problem for the 99% of web pages that contain errors (see why it wasn't widely adopted?). Browsers displaying "text/html" are much more forgiving. The XHTML push is why you might have been told that you need to "close" even unpaired tags like <br> and <img> with a trailing slash, e.g. <br />. That's not necessary in the more forgiving HTML4 or HTML5 specs and has largely been abandoned in practice. Back to actually using HTML5 -- the DOCTYPE declaration tells the browser that you're using HTML5. You can then add some other helpful tags in the <head> to properly specify your page and avoid some security vulnerabilities. In the next few lessons, we'll look at what each of these elements actually is. We'll start by working with the semantic tags in the next lesson and then we'll cover some of HTML5's functional tags and new functionality in the following lesson.